At present, secondary, higher education and tertiary sector in Sri Lanka works isolate in the field of career guidance. Very few institutes share best practices in career guidance in Sri Lanka. In most countries, policy-makers clearly regard career guidance services as being of value not only to the individuals who engage with them but to society as a whole. In other words, they represent not only a private good but also a public good. This is a crucial argument. If they were only a private good, then it could be argued that the provision of such services should be left to the market: that if individuals want them, they should pay for them. It is because they are also perceived as a public good that governments get interested in them and are prepared to support them financially and in other ways. The public-policy goals which policy-makers expect career guidance services to address fall into three main categories. The first learning goals, including improving the efficiency of the education and training system and managing its interface with the labour market. If individuals make decisions about what they are to learn in a well-informed and well-thought-through way, linked to their interests, their capacities and their aspirations, the huge sums of money invested in education and training systems are likely to yield much higher returns. The second is labour market goals, including improving the match between supply and demand and managing adjustments to change. If people find jobs which utilise their potential and meet their own goals, they are likely to be more motivated and therefore more productive. The third is social equity goals, including supporting equal opportunities and promoting social inclusion. Career guidance services can raise the aspirations of disadvantaged groups and support them in getting access to opportunities that might otherwise have been denied to them. The precise nature of these three sets of goals and the balance between and within these categories varies across countries. 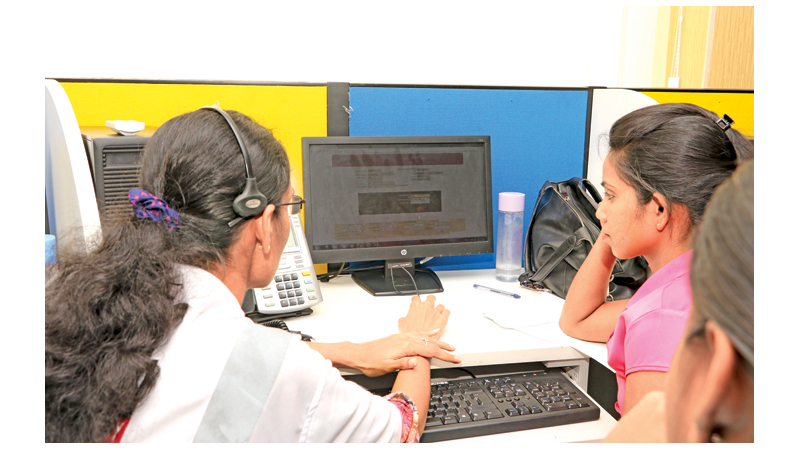 The National Career guidance Service could provide information, advice and guidance across Sri Lanka to help students to make decisions on their learning, training and work. All Candidates sat for the G.C.E advanced level in 2017, counts for 253,330 and only 30,000 (approximately) students are selected to universities. Further, candidates sat for GCE Ordinary level in 2017 counts for 326,424 and percentage qualifying for GCE Advanced level is 70.11% (source: Department of Examinations: Percentage qualifying for GCE Advanced level calculated by number sat for five or more subjects). Having considered the statistics, the question arises on whether we have National guidance system to cater to our students? The public is always searching for correct information and guidance to select their lifelong career path. We as a nation need to think of all these statistics in providing necessary guidance to students. Many state organisations and projects are functioning in Sri Lanka in the education sector. Researches, policymakers have done massive contributions to show the mismatch between the education system and job market in Sri Lanka with special references to soft skills. However, up to date, there is no state sector policy initiative or a National career Guidance system to properly guide the children of this country. Thousands of parents go through the guidance given by Non- State higher education providers without considering the aspirations of the child, without consulting the professional bodies, recognition of universities in the world and the world of work. Some organisations close down their business activities after registering students in order to simply earn the money out of the innocent public. Degree awarding Status granted degrees are gazetted in Sri Lanka and available in the website of the University Grants Commission. Further, web links have been provided in the website of the University Grants Commission for Commonwealth Universities Yearbook published by Association of Commonwealth Universities or International Handbook of Universities published by International Association of Universities to select a recognized university according to the listing in said international publications. Sri Lanka has a separate qualification framework with National vocational Qualification levels to assist students and the public in the learning curve. However, there are thousands of untapped potential of our children who do not come under these learning goals but still, they have another potential in technology and other skills which this country could mould for national development. Sri Lanka enters an increasingly competitive environment in Higher education. After completing secondary education, children and parents face many difficulties in lack of guidance to select options available in higher education, tertiary education and the career path afterwards. Career guidance is crucial to the success of lifelong learning policies. The government regularly state that such policies need to be significantly driven by individuals. The reason is simple: schooling can be designed as a system, but lifelong learning cannot. It needs to embrace many forms of learning, in many different settings. It is the individual who must provide the sense of impetus, of coherence and of continuity. This places career guidance at a centre-stage. It means that if, as many governments believe, lifelong learning is crucial to their country’s economic competitiveness and social wellbeing, then their country’s future is significantly dependent on the quality of the decisions and transitions made by individuals. The world of industry, commerce, healthcare, education, and many others are fluctuating, which is causing considerable anxiety. Labour-market opportunities between high- and low-skill jobs, unemployment and underemployment, stagnating incomes for a large proportion of households, and income inequality demonstrate that the job market is already trending toward the future. The pace of change, driven by technology and globalisation, means that organisations are constantly exposed to change. They are therefore less willing to make long-term commitments to individuals; where they do, it has to be in exchange for task and role flexibility. Either way, therefore, security lies not in employment but in employability. Individuals who want to maintain their employability have to be willing to regularly learn new skills. Internationally, career guidance is now higher on the public policy agenda than ever before. These EU Guidelines, produced by the European Lifelong Guidance Policy Network (ELGPN) provide an agreed reference framework on policies and systems for lifelong guidance across the EU Member States. They aim to assist policymakers and policy developers to reflect in a systematic way on existing career guidance services and programmes in their country with a view to improving them for the benefit of citizens. The ultimate goal is to improve the quality and efficacy of the career learning experience of all EU citizens and the consistency of such experience across the education, training, and employment sectors. They also contribute to strengthening the professionalism of career guidance services, tools and products. They enable Member States to respond coherently to common challenges in education, youth, training, employment and social inclusion policies such as those identified in ET 2020 by facilitating the exchange of learning and experiences and provide a framework for further action on lifelong guidance policy at EU level. The framework and content of the Guidelines are based on the knowledge and experience of members of the European Lifelong Guidance Policy Network. Canada, Ireland and Australia also have a good practice of career guidance for a lifelong process of their citizens. It is the high time to adopt a National Career Guidance system/service in Sri Lanka as the future generation feels that lifelong learning is crucial to the country’s economic competitiveness. Countries are increasingly recognising the need to expand access to career guidance services so that they are available not just for selected groups like school-leavers and the unemployed, but to everyone throughout their lives.